The Kitadani Dinosaur Quarry, on the Sugiyama River within the city limits of Katsuyama, has yielded animals such As Fukuiraptor, Fukuisaurus, Nipponosaurus, Koshisaurus, Fukuivenator, Fukuititan and Tambatitanis as well as an unnamed dromaeosaurid. Many dinosaur fossils have been excavated in Fukui and they can be seen at the Fukui Prefectural Dinosaur Museum. ^ Nussbaum, Louis-Frédéric. (2005). "Fukui-ken" in Japan Encyclopedia, p. 217, p. 217, at Google Books; "Chūbu" Japan Encyclopedia, p. 126, p. 126, at Google Books. ^ Nussbaum, "Fukui" in Japan Encyclopedia, p. 217, p. 217, at Google Books. ^ Nussbaum, "Provinces and prefectures" in Japan Encyclopedia, p. 780, p. 780, at Google Books. ^ "General overview of area figures for Natural Parks by prefecture" (PDF). Ministry of the Environment. Retrieved 4 February 2012. Wikivoyage has a travel guide for Fukui (prefecture). 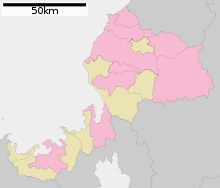 Wikimedia Commons has media related to Fukui prefecture.